Earthworms have numerous benefits for lawns; they help control thatch plus add organic matter and bacteria, and they help aerate the soil and increase the penetration of water. They are also food for moles and are the host for cluster flies. The castings of high populations of worms can cause unsightly bumps on the surface of the lawns however, and there are ways to get rid of them. White grubs that eat grass roots are sometimes called worms. That is a misnomer; white grubs are actually beetle larvae, often that of the Japanese beetle. Earthworms are larger. The common earthworm or night crawler (Lumbricus terrestris) can grow up to 9 inches long. The red wriggler (Eisenia fetida) that grows up to 6 inches long is popular for composting and for fishing bait. Although earthworms have both female and male reproductive organs, an exchange of sperm requires two worms. They take in soil and organic matter at one end and extrude residue called castings at the other. 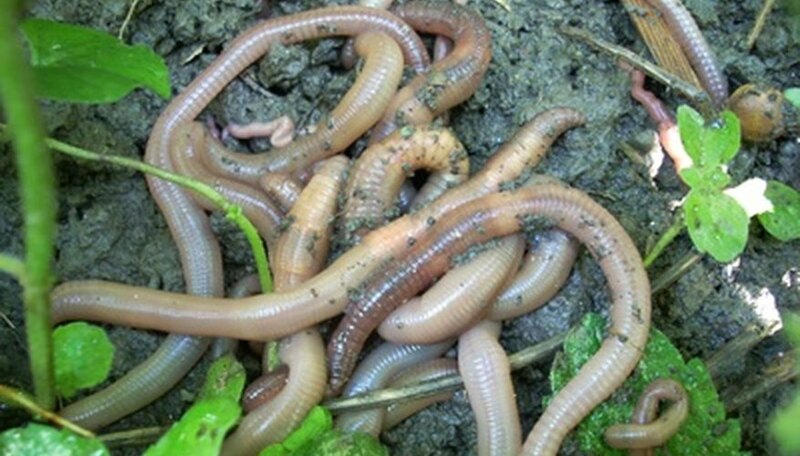 North Carolina State University horticulturalists say worms do not like acidic soils, and there are reports that they do not inhabit soils with a pH below 4.5. Colorado State horticulturalists say applying high rates of ammonium sulfate to increase the soil acidity might help, but soil should be tested and the needs of the grass should be considered. Dr. Ian Plummer of Balliol College, Oxford University, says the least expensive way to lower soil pH is to apply 1/4 oz. of calcined sulphate of iron per square yard of grass. The EPA does not register any pesticides for worm control. The British Health and Safety Executive lists two fungicides thiophanate-methyl and carbendazim as being useful for controlling worms. A study conducted by the Department of Entomology at the University of Kentucky concluded that applications of insecticides containing the active ingredient carbaryl reduced worm populations by 76 to 100 percent. Insecticides containing the active ingredient diazinon were less effective, killing 26 to 50 percent of the worms. Herbicides containing 2,4-D were least effective killing none to 25 percent of a worm population. A vermifuge is a chemical irritant that forces earthworms to the surface where they can be collected physically. Researchers at the University of Central Lancashire in the UK reported that using 2 oz. of mustard powder to 2 1/2 gallons of water was a cheap, effective vermifuge. Those researchers state hot mustard and allyl isothiocyanate, an extract derived from mustard seed, are also useful as a vermifuge. Horticulturalists at Virginia Tech University recommend solutions of potassium permanganate. Worms can also be driven to the surface by applying electricity through rods. What Are the Treatments for Grubs Eating Zoysia Grass?